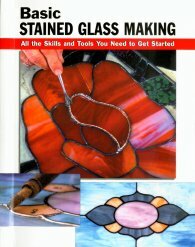 These books will give you a great start in stained glass. by Ebeling and Johnston is a highly detailed guide containing everything the beginner needs to know to make beautiful basic stained glass projects--presented with lavish color illustrations and precise instructions that eliminate the guesswork from each step-by-step activity. 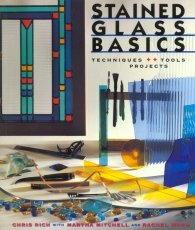 Expert techniques and tips for cutting and polishing glass, tracing patterns, soldering, and more are explained with the beginner in mind. Included is an indispensable section on tools and materials used to make each of the pieces--from classic flat-panel creations to a Tiffany-style lamp. Other topics: setting up a good workspace, safety guidelines, and project variations. With 768 color photos on 128 pages, spiral bound for easy reference. With straightforward text and a wealth of color photos, this book will show you how to master more advanced stained glass-making techniques: making complex cuts with a table saw and repeating cuts with a jig system, making and installing hinges, foiling glass jewels and nuggets, creating and fastening mosaic pieces, using a lamp jig, applying patinas to lead and zinc, installing reinforcing wire properly--all skills that will allow you to expand your creative horizons. It also offers step-by-step instructions for creating a tabletop box, a large hanging lampshade, and a decorative mosaic--along with a host of expert advice on how to improve your stained glass-making skills. 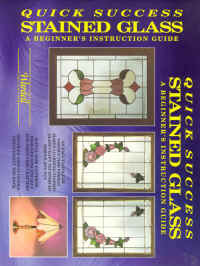 by Rich, Ward and Mitchell covers all aspects of stained glass instruction. 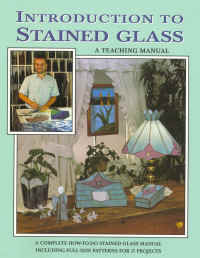 With plenty of full color photos, this book is an easy to follow guide for learning stained glass. 30 projects are presented. Soft cover, with 144 pages, all in color! by Randy and Judy Wardell is perfect for those who wish to teach themselves as it follows the material in a logical order. Over 100 full color photos help you master the craft! This is one of the top selling books in the craft! by Art Glass Originals. This book covers the basics of copper foil, lead, acid etching and mosaic techniques in several easy to manage projects. Full color photo galleries of original work by the authors and other artists will inspire any budding crafter.